Lloyd Alexander is a writer who made me cry. Not with this book, but with his Chronicles of Prydain series. If I remember right, which I rarely do, this was a funny little book about a minor character and a magic pig. I think the pig foretold the future or something? I read this particular book, which is really more of a novella, because I was hungry for more stories about Prydain, and this one was pretty much it. The pig escapes, Coll chases after it, there are adventures of some sort or another, and then he gets the pig back. In case you don’t know, Prydain is a fantastical/mythical world that seems to be inspired by Welsh (and possibly English and Irish) mythology. [It occurs to me, thinking about this and Susan Cooper’s DARK IS RISING books, that there seems to have been a real thing for Welsh-inspired young adult fantasy novels in the 1970s. Fascinating! I don’t really have much else to say about this little book, except that it reminds me, happily, of all the time I spent romping through Lloyd Alexander’s adventures. 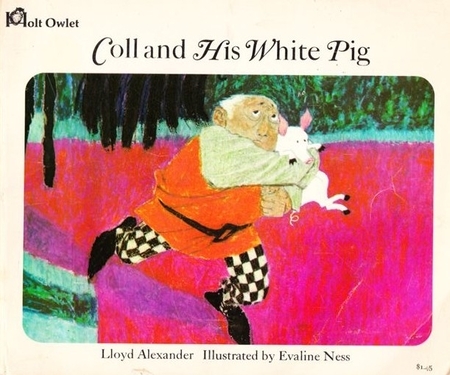 I expect that Coll and his white pig are deeply out of print, but perhaps not? At any rate, if you haven’t read any of his books, I wouldn’t recommend you start with this one, but rather THE BLACK CAULDRON, one of the Vesper Holly books–think Indiana Jones, except twenty years younger and a woman–, or perhaps even THE FIRST TWO LIVES OF LUKAS-KASHA. I remember clearly the day that the librarian in my local public library pressed OVER SEA, UNDER STONE into my ten-year-old hand. I loved its moody, sinister atmosphere, as well as its subtle non-Gandalfy magic. Its sequel, THE DARK IS RISING, threw me for a loop when it veered away from the protagonists in the first book, introducing a new one. By the time I got to THE GREY KING, though, I was hooked, in that galloping, all-consuming reading mode I sometimes fall into. My memory of this book is that of anger, though, and though I may have liked it, I didn’t enjoy it. You see, somewhere in the middle of reading this book, I did something–I don’t recall what, although knowing me, it probably involved refusing to do something–that upset my mom so much that, in order to punish me, she took this book away for two or three weeks. Of any punishment I ever received from my parents, this one was the worst. At the time, I only read one book at a time, and read each one to completion. Not finishing a book felt like cheating somehow. Not only was a I deprived of the story I was immersed in, but I found it incredibly difficult to start a new book. I mean, now, it feels wildly overly dramatic to say that it felt like the emotional equivalent of losing a friend, but it did kind of feel that way. Then, when I finally got my hands on THE GREY KING again, I felt like I had to start the book over from the beginning. I think I might have enjoyed the book more, but every moment reading it reminded me of what had happened, filling me with anger. How can emotion not affect one’s experience of reading a book? I’ve always meant to re-read Susan Cooper’s series, but never quite got around to it. I suspect it has something to do with the emotional associations I have with this book. So, to parents of budding bibliophiles, please don’t ever take your kid’s book away. They’ll probably never forget it, long after they’ve forgotten just everything about the book itself. As for the book, the cover’s no lie. 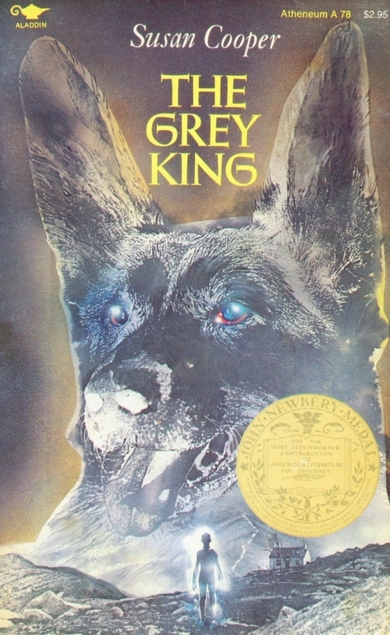 The book features a giant silver wolf. This book was also my first encounter with Wales, which I don’t think I had ever heard of before. In spite of rage-flecked memories of this book, I’m pretty sure I would recommend it, and the rest of the series, to just about anyone. 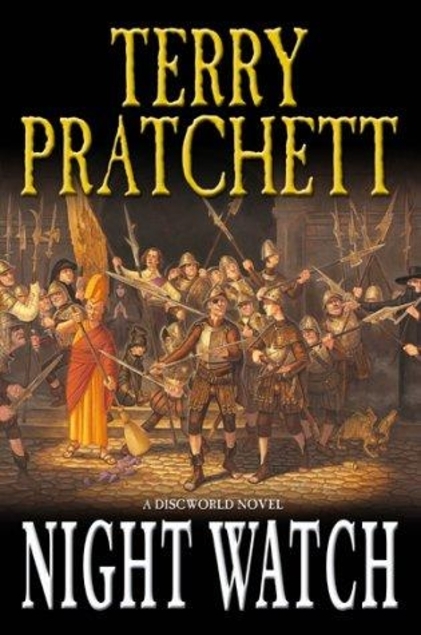 NIGHT WATCH was probably the 3rd or 4th of Terry Pratchett’s books that I read. Of his Discworld books, I much prefer his stories set in the rambling, chaotic city of Ankh-Morpork. Even though they’re set in a fantasy world, Pratchett’s books are delightful mishmash of tropes from other genres, with NIGHT WATCH being a gritty police tale. Pratchett books–especially most recently–seem to take a single theme or subject matter, whether it’s the post office, the newspaper, even the internet, and explore that idea fully. What might it have been like to set up the first post office? That kind of thing. But by grounding it in a fantastical setting, Pratchett sidles up to its subject matter in such an oblique way, that I expect his younger readers don’t realize the kind of teaching that he’s doing. If I recall, in NIGHT WATCH, this fellow, Vimes, is assigned to take over a police precinct, along with a strapping young lad raised by dwarves, name of Carrot. Together they solve crimes (or really, a crime), and begin to build the precinct up to a workable thing. Pretty soon (and I think some of this happens in later books) they have a troll, a vampire, a werewolf, among many others, on the police force. When I was younger, I sequestered myself pretty heavily into the science fiction/fantasy genres–what people are calling speculative fiction these days, I guess. I had nothing against other types of books, but I just wasn’t inclined to read broadly. NIGHT WATCH provided a stealth introduction to the police procedural/crime genre. Something I didn’t realize until much later, when I actually read a book like that. At this point, I think I’ve read more than twenty of Pratchett’s books, which is nowhere near all of them. It sometimes feels like he writes them faster than I can catch up reading them. Pratchett is a warm, and likable author, and his authorial voice shines through his books like a beacon. Not only are his books funny and insightful, but they’re really just romping great yarns. If you haven’t read any Pratchett, you could do a lot worse than by picking up NIGHT WATCH. Ah, Douglas Adams. Talk about another formative book/author. I had only been friends with Joel for weeks, or possibly months, when he pressed THE HITCHHIKER’S GUIDE TO THE GALAXY into my hand. One long gulp later, and I’d read all four books in the HITCHHIKER’S GUIDE “trilogy”. For me, I think of all of those books as a single piece, and their surreal, science-fictional whimsy tweaked some kind of humor center in my brain, nudging it slightly off-kilter. 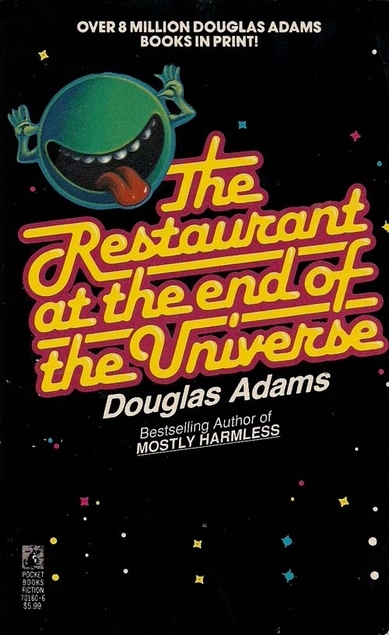 Actually, I’m not sure I remember having much of sense of humor before reading Douglas Adams. Am I ascribing too much importance to the man? Maybe, but I do know that much of humor from the age of 12 to 15 involved reciting Adams humorous set-pieces and recreating Monty Python dialogue, from QUEST FOR THE HOLY GRAIL, natch. It’s not so much that I was a humorless child, although I remember myself being an oh-so-serious one, drawn, usually, more to the gloomy and doomy. Hey, I liked Winnie-the-Pooh as much as the next guy, but it was also Eeyore that I felt the closest to, with his thistles and mournful birthday parties, ever uplifted by the love and kindness of friends. Even now, with those who’ve known me longest, I feel like I labor under the misapprehension that I never josh, or joke, or giggle. It’s true, much of my humor–the stuff that most tickles me–involves playing the straight man to the world’s goofballs and weirdos, pretending as though all their most wacky pronouncements are true true true. It’s my version of the improvvers “yes, and…” Without being fed those whacked out lines, I flounder in the subtlety of my own humor, because it begins to seem like not so much a joke at all. So, Douglas Adams has much to answer for, providing me with one exit door out from my gloomy room. As far as the RESTAURANT goes, as an individual book, it’s time-loosed restaurant itself that stands out, with the beast offering itself up for dinner, and the glorious view onto the beginning and end of the universe. POW! I’ve decided to start writing little pieces about books that I’ve read in the past. Mostly, I’m doing it for myself so that my writing chops don’t get rusty, but if someone happens upon one of these and gets something out of it, all the better. I’m selecting books using my books read list and a random number generator. 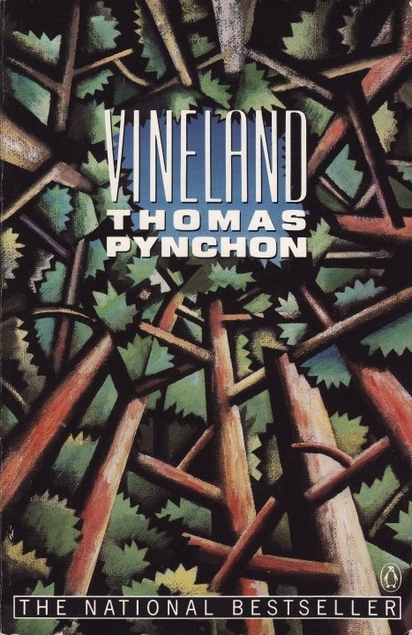 Thomas Pynchon’s VINELAND was only the second of his books that I read, after THE CRYING OF LOT 49. If my memory hasn’t failed me, my dad handed it to me, almost on the sly, as I headed off for college, either my freshman or sophomore year. To a naive, somewhat religiously sheltered lad, VINELAND was an eye-opener in a way that LOT 49 wasn’t. I’d always been enamored of the fantastical in fiction, with my main touchstones being Tolkien and CS Lewis, I think, in part, because of the way they unearthed numinous wonder out of the real. I’ve always had a slight aversion to the tedium of the mundane, and VINELAND proposed a solution to that: the idea that high strange weirdness, secrets and conspiracies, and obscure, occult knowledge lurked underneath that ubiquitous mundanity. I mean, LOT 49 touched on those things too, but it felt more like a fairy-tale, while VINELAND’s epicenter was Northern California, and contained enough “real” hooks that, combined with the aura of the fantastical, it reeled me in completely. I think I can thank VINELAND for the beginnings of my distrust and skepticism of government and corporate activities, or really any organizations involving large number of hurrying, scurrying human beings. Funnily enough, considering the random nature of this pick, I’m actually reading Pynchon’s newest book right now, BLEEDING EDGE, and it feels the most like VINELAND of any of his other books, only set in NYC in the strange days before 9/11. I’ve read so many books, that, usually, all that’s left of a book in my mind are echoes of its impressions. For me, I remember very little of the book’s plot, which I seem to recall involved a precocious teenage girl, her hippy dad (or maybe her dad was a government agent? ), some plot involving drugs and other things, and… that’s where I reach the limit of my memory. For me, I tend to think of Pynchon’s books in two categories: Easy to Read and Tough to Read. VINELAND falls into the Easy to Read category, along with BLEEDING EDGE, CRYING OF LOT 49, and INHERENT VICE, while MASON & DIXON and AGAINST THE DAY fall into the Tough to Read column. Hey, me, I love Pynchon, but if you’re new to his stuff, I’d recommend something from those “easy to read” ones. This isn’t to say that they’re simple or actually “easy”, but compared to the “tough” ones, they require quite a bit less effort.